Say “No” to big, bulky toothbrushes! The size, shape and mass of our handles is optimized for gentle & precise control. The length & diameter of our bristles are designed to be effective in cleaning the gingival crevice & the pits & fissures of a tooth. The POH toothbrush is designed for fingertip control & sensitivity. The commercial market toothbrushes available today are typically longer, wider & heavier than POH toothbrushes. POH relies on Dr. Bass’ research that this type of toothbrush imparts too much leverage (possibly damaging the delicate gum tissue) & limits the dexterity required for effective cleaning of the teeth using the Bass Method of personal oral hygiene. Follow the link and read a back-and-forth we recently had. Not everyone is totally happy with our toothbrushes. POH uses 67% Copper brads in the bristle anchors. Copper, being well known for having anti-microbial properties, is simply the best material to use. It won’t, of course, eliminate infection in your mouth. It will degrade the ability of nasty germs to set up their secret little world on your toothbrush! 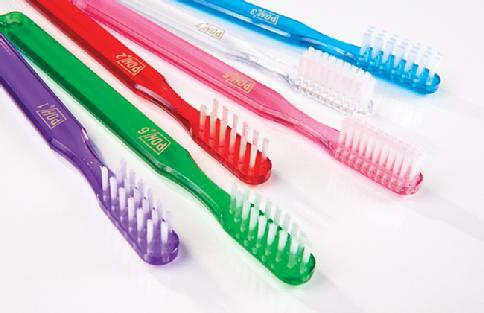 POH toothbrushes come in an assortment of colors, the colors shown are not specific to a particular toothbrush, and of course vary from the real life article. Everything you need in a toothbrush, and nothing you don’t! It’s been many years since someone bent the neck of a toothbrush, presumably to increase sales. After the bent neck came the thumb stop, then the multi-plastic handles, then a tongue cleaner, etc. POH never took that route. POH does not do the “New & Improved!” thing every other year. We understand that the fundamental research upon which our designs are based is sound. POH will give you everything you need in a toothbrush, without the unnecessary, expensive bells and whistles. Around 1960, with Dr. Bass’ authorization, Robert G. Jones, DDS, our founder, went to the existing toothbrush manufacturers to see if they would make Dr. Bass’ type of toothbrush. Each company Dr. Jones approached turned him down flat, saying there was no customer demand, it would be an added expense, no, we will not make them. Undaunted, Dr. Jones started POH to make both the floss and toothbrushes we market today. The same toothbrush and floss that Dr. Jones had been receiving directly from Dr. Bass. POH – Our mission for more than fifty years is to help you clean and keep your teeth. The importance of simply & effectively cleaning your teeth daily cannot be emphasized enough.